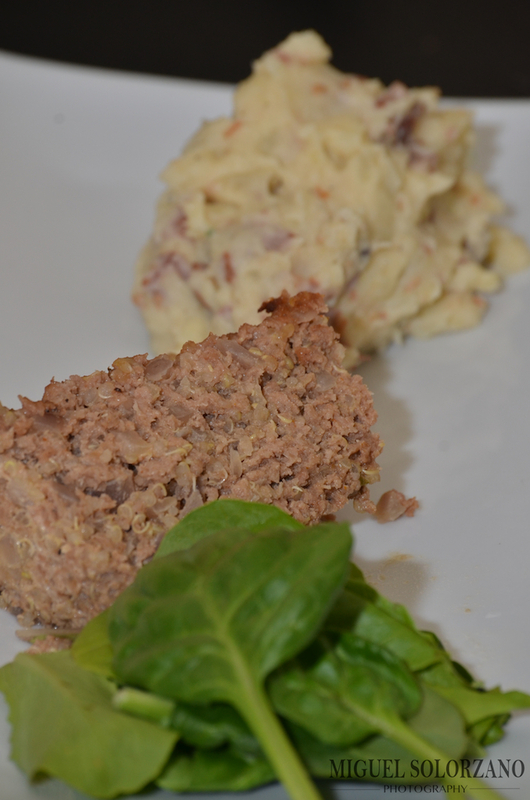 This recipe for Turkey and Quinoa Meatloaf is a great alternative to a ground beef recipe. You’ll cut calories and add texture and health benefits of the ingredient exchange. The quinoa in this meatloaf really adds a nice, but subtle, crunch. And you won’t miss the ground beef once you’ve traded it out for ground turkey. 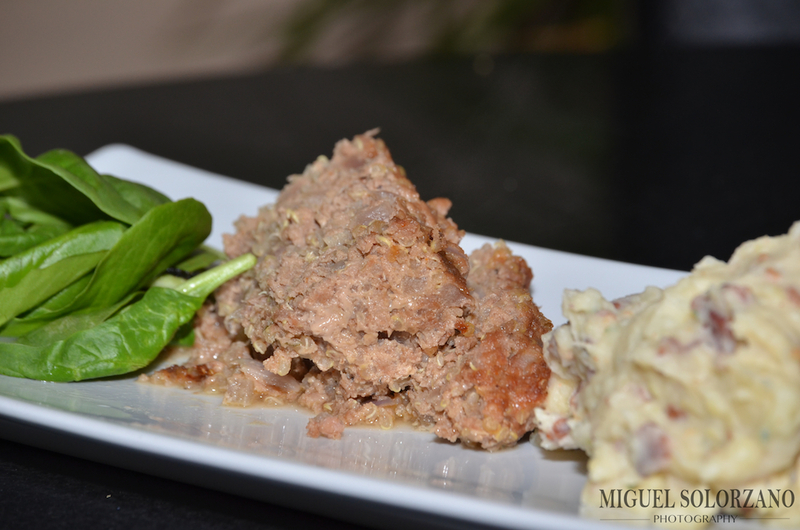 Turkey and Quinoa Meatloaf is a healthy alternative to ground beef meatloaf. Bring the quinoa and 1/2 cup of water to a boil in a saucepan over high heat. Reduce heat to medium-low, cover, and simmer until the quinoa is tender, about 15 to 20 minutes. Set aside to cool. Heat olive oil over medium heat in a large skillet. Stir in the onion; cook and stir until the onion turns translucent, about 5 minutes. Add the garlic and cook for an additional minute; remove from heat to cool. Stir the ground turkey, cooked quinoa, onions, ketchup, hot sauce, 2 tablespoons Worcestershire, eggs, salt, and pepper in a large bowl until well combined. The mixture will be very moist. Combine the brown sugar, 2 teaspoons Worcestershire, and 1 teaspoon water in a small bowl. Rub the mixture over the top of the meatloaf. Transfer squash to prepared baking sheet and roast, turning occasionally, for 20 minutes or until tender and lightly golden. Let cool slightly. Bake until no longer pink in the center, about 50 minutes. Use a meat thermometer to assure the meatloaf has cooked to an internal temperature of at least 160F. Let the meatloaf cool for 10 minutes before slicing and serving. I’ll admit that this meatloaf doesn’t photograph well, but I can promise you it’s full of flavor. I served mine with some mashed new potatoes for a classic Americana pairing. Feel free to play around with different spice blends if you want to give it an extra kick. Sometimes salt and pepper are all you need for seasoning, sometimes you want more. Either way, just about any spices will go well wit this Turkey and Quinoa Meatloaf. With beach season quickly approaching, I’m all about healthy recipes right now. 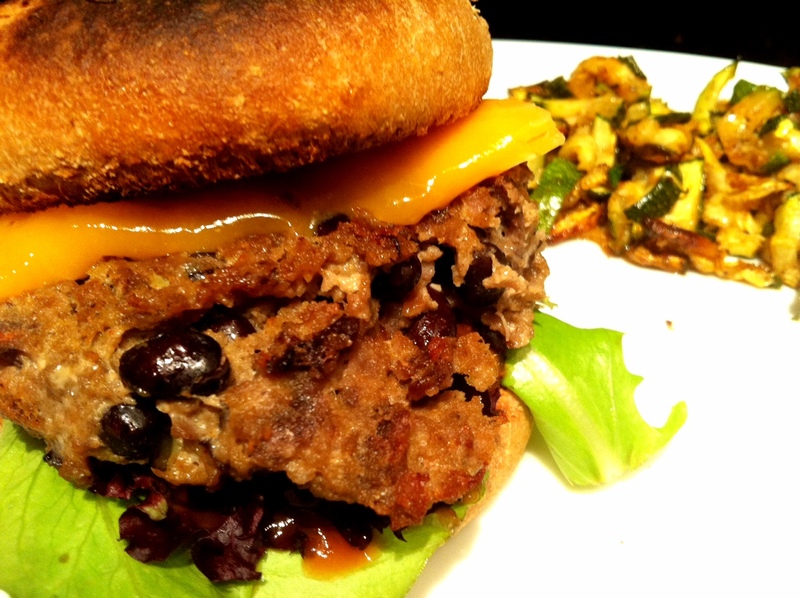 Here’s a great, healthy recipe for Black Bean-Turkey Burgers. This recipe sacrifices the calories, but not the flavor which is ideal when trying to eat right. Set oven broiler on high. In a large bowl, combine ground turkey, beans, avocado, egg, tortilla chips and seasoning/spices. Mix with hands and form 6-8 equal-sized patties. Alternatively, you can mix everything by hand and use a biscuit cutter to form your patties. In an oven-safe skillet, pour in oil then place two patties in skillet. Broil for 5 minutes, flip and broil another 5 minutes. If you don’t have a broiler, this can be done on the stove burner on medium-high. Transfer the cooked patties to a paper towel-line plate to drain. Serve the burgers on a whole wheat bun and spoon salsa on top. Add cheese, lettuce and other toppings as you like. I was able to get 8 servings out of this recipe. The burgers come out juicy and with a nice texture although they may break apart more than a typical hamburger. Maybe more important than the healthiness of these Black Bean-Turkey Burgers is the fact they can be prepped in about 30 minutes. Also, if you have leftover patties, you can freeze them and serve them later. Lasagna is one of the best family-style meals out there. 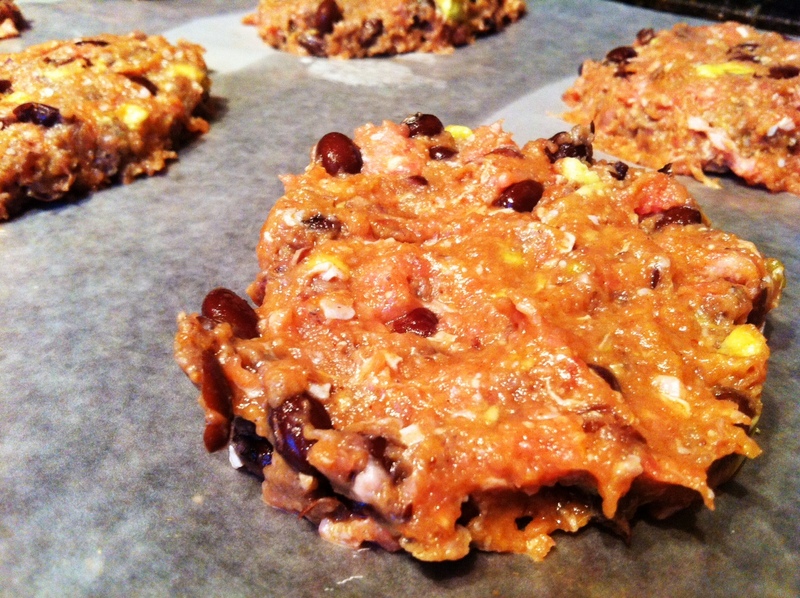 However, it’s loaded with carbs and calories so here’s a recipe that should cut down on both. 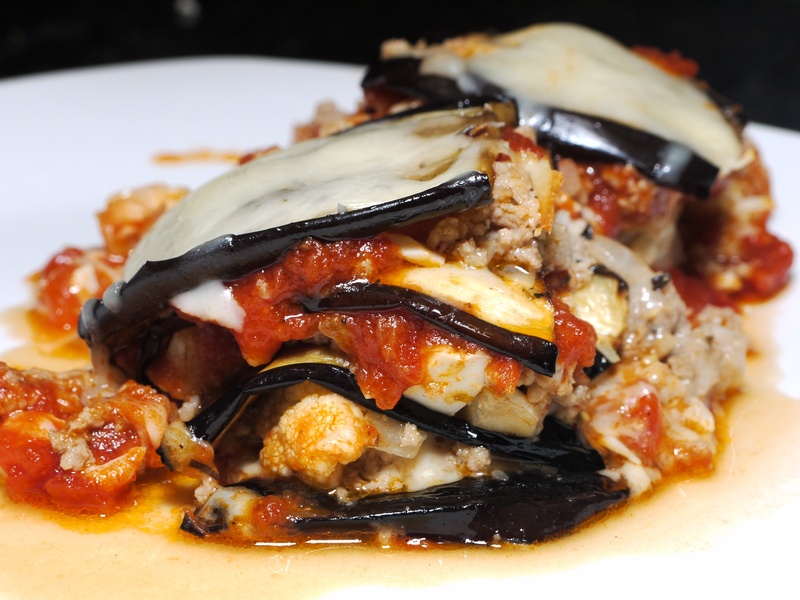 Instead of using pasta, thinly sliced eggplant serves as the layers. I also add some cauliflower to give this lasagna a little bit of a crunch. Mix the oil with Italian seasoning, salt and pepper. Then, brush eggplant sheets with oil and spices mixture. Lay the eggplant in a single layer on a baking sheet (you will have to do this more than once). Broil them 2 inches from the flame for about 3 to 4 minutes. Remove from home and turn to the other side brushing with the oil mixture and broiling for 3 to 4 minutes. 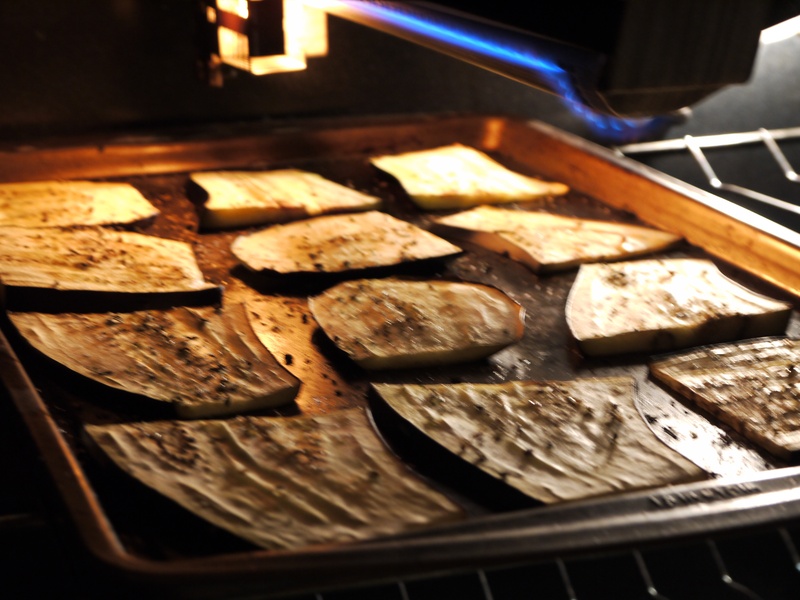 Repeat until all of eggplant is broiled then set oven to 350F. 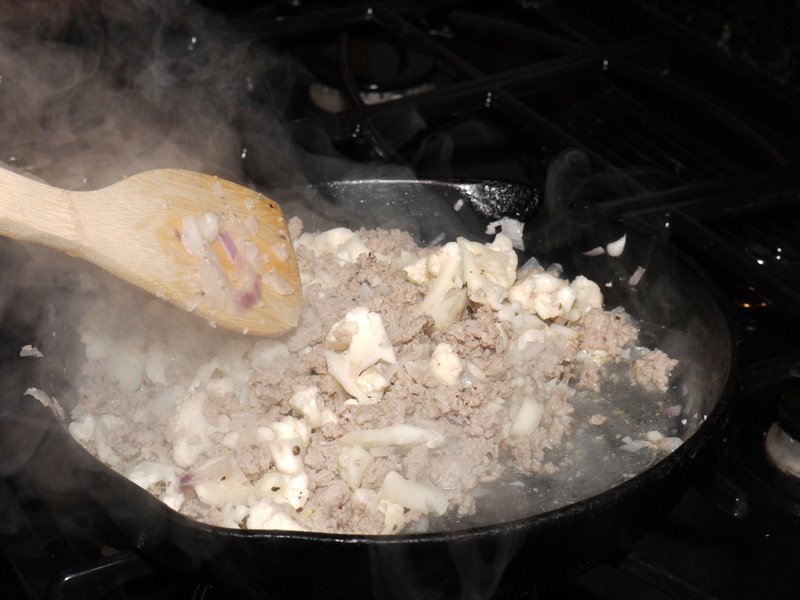 In the meantime, saute ground turkey, cauliflower, garlic, shallots and red onion in a medium-sized pan. Cook until turkey meat is browned then add in chopped hardboiled egg. Once all ingredients are cooked, place one-third of the eggplant sheets in a wide, shallow 2- or 3-quart casserole dish. Layer with mozzarella, parmesan, ricotta, ground turkey mix and pasta sauce. Repeat the layering two additional times then top with mozzarella. Cover and bake for 20 to 25 minutes then serve. This is recipe that will feed you and your family of 4 to 6. You won’t even notice that it’s not pasta, but eggplant that makes up most of the dish. You can also substitute any ground meat of your choosing if you don’t want to use turkey. It may not be 100% authentic Italian, but it will do in a pinch and it’s sure to please most people’s palettes.